A disappointing program from one of the world’s finest ballet troupes. The Royal Ballet’s second program of its ridiculously short season at the David H. Koch Theater was disappointing as much for what was on it as for what wasn’t. What wasn’t there were any classical works. Among divertissement-type short works making up the second part of the show, there was not one classical Pas de Deux. Instead, the program opened with an abstruse modern ballet and ended with an equally abstruse new version of an old one with six very short works of varying quality and appropriateness sandwiched in between. True, the stated “theme” of the season was to highlight the work of English choreographers, but The Royal Ballet is, first and foremost, a classical ballet company. Infra, by Wayne McGregor to a throbbing piano score by Max Richter, interspersed with electronically manipulated voices, is yet another battle of the sexes in which the men keep manipulating the women into breathtakingly acrobatic poses, all the while feigning angst of unknown origin. The most salient element, designed by Julian Opie, was a raised wide strip of lights on which cartoony schematics of people walked back and forth, often taking attention from the live dancers below. There was much crossing back and forth of lines of dancers that coalesced into duets. The strength and partnering abilities of the male contingent were tested, but their ability to put more than two steps together wasn’t. The women showed off their litheness in stretches, off-balance poses and daring lifts. The dark lighting by Lucy Carter only made the fantasy people on the light panel on the upper part of the back wall stand out more. Mr. McGregor’s choreography is demanding on the dancers, but not particularly musically or emotionally satisfying. The six choreographic baubles that made up the middle of the program were decently danced, but were over too quickly to make any real impression. Voices of Spring, a duet by Frederick Ashton to exuberant waltz music by Johann Strauss II, was originally a pièce d’occasion inserted into a performance of Die Fledermaus. It’s just a series of Soviet style big lifts—here performed with little charisma by Akane Takada and Valentino Zucchetti—meant to entertain the onstage cast of the opera and the audience. It was fun to see the tiny excerpt from the Bronislava Nijinska/Darius Milhaud Le Train bleu danced by a game Vadim Muntagirov, but without the original Henri Laurens scenery it was just a cute, fit young man in Coco Chanel’s colorful period bathing suit leaping about. Calvin Richardson’s The Dying Swan, danced by Richardson, himself, to the famous Saint-Saëns music, evoked the original Fokine solo with some undulating arms and a graceful collapse to the floor, but otherwise did not illuminate its source material. Christopher Wheeldon, a graduate of The Royal Ballet, contributed his duet Aeternum to Benjamin Britten, a work that extended the classical vocabulary into leans and yearning reaches of legs and arms. Claire Calvert and Ryoichi Hirano were the two sad lovers who were mutually dependent, yet—significantly—tended to bend away from each other. Kenneth MacMillan’s Carousel “If I Loved You” duet was, of course, staged to the famous Rodgers and Hammerstein song, using the version that accompanied the famous second act ballet. Lauren Cuthbertson was the confused, sad Louise and Matthew Golding her swain who made love to and abandoned her. MacMillan’s steps to the luscious Rodgers music economically conveyed all the subtle emotions of this youthful romantic couple. Unfortunately, Agnes de Mille’s original, preserved in the film, was far more emotionally rich. Leonard Bernstein’s The Age of Anxiety is musically—and choreographically—the flipside of his Fancy Free and On the Town. The characters in the latter two are happy in their search for love and adventure. The characters in Anxiety are based on the W.H. Auden book-length 1947 poem that dramatized the post-World War Two existential struggles of a small group of New Yorkers. They are fraught with emotional emptiness, sexual duplicity and sadness. 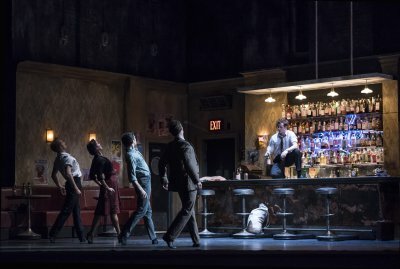 The original Jerome Robbins choreography to Bernstein’s dreamy, dark score has been lost, but Liam Scarlett’s version, more a dance/mime, was effective in expressing the angst of the four main characters who meet in a bar, a period-perfect set by John Macfarlane. After drinking, flirting and dancing at the bar, they reconvene in the art deco living room of the female character’s posh apartment. The rich score, with its echoes of Gershwin, Copland and Bernstein’s own urban sounds, supplied the perfect aural setting for the twisty tale of a drink-fueled quartet looking for love and excitement. Scarlett’s choreography consists of lots of variations on period popular dances, walking around and surreptitious fondles of butts. That virtually every male showed gay tendencies—whether for sexual, romantic or financial gain—complicated the drama. That no one actually gets any satisfaction—quite the opposite—turns The Age of Anxiety into a perplexing piece of dance theater. 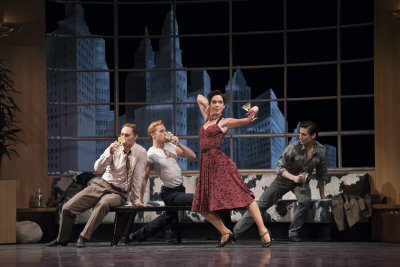 The four leads—Sarah Lamb, Alexander Campbell, Johannes Stepanek and Federico Bonelli—produced finely detailed characters with their looks, physical attitudes and dancing. Mr. Macfarlane’s extraordinary costumes defined the characters with wit and pinpoint period detailing, from the uniforms of the soldier and sailor to the dresses of the two women that clearly indicated class and attitude. The Royal Ballet is still a force in the international dance scene, but doesn’t have the sheen, or the star power, it once had. How they do in the classical repertoire is difficult to infer from the surprisingly limited repertoire they brought to New York City where the troupe used to play for month-long seasons. Only in Ashton’s The Dream was there evidence of classical purity. Royal Shakespeare Company’s epic production of the story of Thomas Cromwell, Henry VIII and Anne Boleyn from the Hilary Mantel novels is intellectually and historically challenging. A muscular, sensual dance troupe doing justice to three emotionally and physically challenging works. Not a nature documentary, but a beautiful parable about human loss and love.